The wait is over! We are super excited to announce the release of Shika 1.3 which brings a whole lot of new features for you. A new lesson type for exercises with an assessment engine, new question types, support for question grouping as well as dashboards powered by our new engine-TJ Dashboard. Detailed upgrade related instructions are given in the release notes. Make sure you read them carefully before you upgrade. Buy Shika Now! View Shika Demo! Shika 1.3 brings to you a simpler UI for selecting a lesson type at the time of lesson creation. With quiz as lesson, we have combined ”Score and Result” Tab in previous versions of Shika with the “Add Questions” tab in Shika 1.3 and brings a simpler UX with total marks getting auto calculated and you will only need to add passing marks. With larger quizzes, being able to group questions in sections can help present them better. This will also be used in the future as a reporting data point and decide pagination logic. We auto create one section by default. You can add more as required. 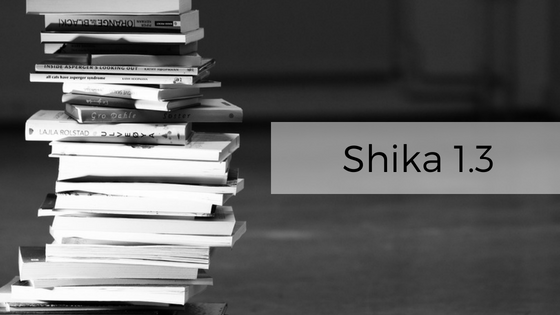 Shika traditionally supported quizzes with MCQs & MRQs that are auto graded. With this release, you can now add subjective questions to Quizzes. With quizzes having subjective questions, an ‘Assessor’ needs to assess the Subjective questions and score them. Exercises are the big feature in Shika that allow you to assess your users on a broader base. With this you can create exercises that have free text input, file uploads, Radio, Checkbox, rating type questions. This allows your exercise to be as broad based as you need it to be and evaluate the user better which is not possible in a typical quiz. When you are evaluating exercises - it is extremely useful to be able to give your assessments a structure to ensure that your assessors cover all the critical areas in their thought process. The Assessment engine allows you to create an assessment form (which is linked to exercises) and set a structure for the assessment. Assessment parameters have scores and can be presented as Star Ratings, Text Input, Checkboxes or drop downs. We also support parameter weights which allow you to give varying importance to each parameter while showing a standard form to the assessor. For instance you might want your assessor to rate an exercise on Technical Competence, Language & Presentation all on scale of 5. However you on the backend want to give a double weight to Technical competence. By keeping same scores but different weights you can get a balanced assessment . You can also have multiple assessors assess the exercise and define if you want the final score to be the latest, best or average of the assessments. Course creators will often want to get feedback from their students in a comprehensive way. You can create forms using all the available question types and use them multiple times in a course. Using the Prerequisites & Required for passing features, you can create multiple feedbacks as you need them. Shika 1.3 brings our latest horizontal extension - TJ Dashboards to the Joomla world. For you as an admin it opens up a world of possibilities in the future to create comprehensive site wide information dashboards (albeit right now with some development). The immediate benefit of this is an improved UI, a modern widget based architecture and better configurability. If you are a developer you can also easily add new widgets or modify presentation of existing ones!